Abbreviation IDCEE stands for “Investor Day Central and Eastern Europe 2011”. Focused on Internet technologies and innovations, event gathered 150 startups, hundreds of investors and journalists from major CIS tech resources, TechCrunch, TheNextWeb and other media outlets.The startup conference consisted of 2 days and was hosted in Kyiv, Ukraine. Every startup had a booth. 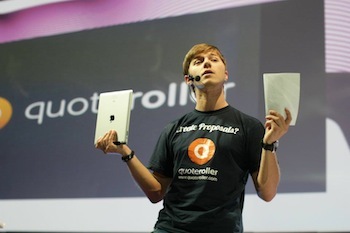 We were able to meet with hundreds of industry professionals and present the Quote Roller to them. Organizers did a great job on bringing together a number of prominent speakers in high tech and startup fields including Esther Dyson, Florian Schweitzer, David Waroquier, Stefan Glaenzer, and others. And again, Quote Roller made it on the stage. Thanks to quite a bit of experience gained at Startup Week 2011 I was not too nervous so the pitch went really well. Final 4 startups included PinPoint, Mixgar (got the first prize), Quote Roller and SpeakToIt. Using IPADs is better then paper, right? After the judging, we got a second prize all together with a cash prize of almost 3k in euros and, of course, some featuring via TechCrunch and TheNextWeb. I enjoyed the event and met a number of great people there. And, frankly, I am glad that the Eastern Europe has a strong community of great startups, entrepreneurs, and investors. 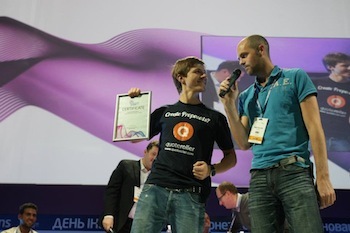 Our team is really thankful to the folks from Ukraine who made this event happen. We’ll definitely make it there for IDCEE 2012. Want to find out more? Check Natasha’s Starkell post on the TechCrunch about the event.